Which brands top the charts on Shopilly? Everyone knows how many friends you have on Facebook, how many followers on Twitter and what skirts you’re trying to decide between to match your new Tory Burch heels. We were naturally wondering who Shopilly’s shoppers love the most so we decided to take a look at which brands have the most followers. These power players have everyone watching them, waiting to snap up their best sales newest designs. 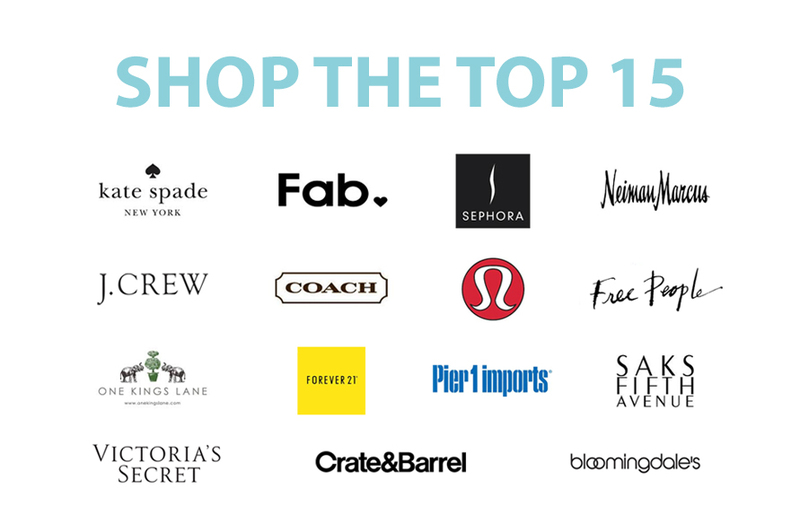 Of course, you can find all the insider discounts from these brands and many more at Shopilly. J.Crew – The reigning king (or queen?) of Shopilly has something for everyone but manages to also stay current and distinctive. Victoria’s Secret – Almost as popular with the guys as with the girls, VS is staple of our wardrobe. Fab – This online only seller of cool, quirky designer goods has caught everyone’s attention. They’re moving from flash sales to a more regular merchandising schedule. We can’t wait to see what’s next. Bloomingdale’s – Always in style and our favorite place to check first before shopping anywhere, Bloomie’s has the top designers for men and women. Sephora – Where would we be without Sephora? It’s not just about the products and the selection, which is amazing, it’s about the advice and service. A one stop shop that keeps us looking good. Lululemon – Either there are way too many people out there doing Vinyasa or the secret is out that Lululemon makes for great, comfy-yet-cute every day outfits. Sporty and flattering, we love Lulu! Crate & Barrel – The top home décor retailer on the list, C&B has everything you need to deck out your place with chic, affordable style. Kate Spade – Kate’s bags never cease to make the top of the wish list. Classic and elegant but with enough signature “Kate-ness” to get us noticed. Coach – Bags to die for, glamorous sunglasses and one of our favorite fragrances. What’s not to love? Forever 21 – Everyone’s favorite fast fashion destination let’s us keep the latest trends in our wardrobe without breaking the bank. Mix and match with designer apparel to keep your wardrobe current. One Kings Lane – We don’t know where they keep turning up all the amazing furniture and art and antiques but we can’t get enough. Everyday something new and fun is waiting. Neiman Marcus – This luxury department store brings together all the brands we love under one roof and Last Call has some of the best deals anywhere. Pier 1 Imports – Hip, eclectic and affordable, Pier 1 assembles international décor and accents into an always surprising mix. Saks Fifth Avenue – By maintaining the best collections from top designers and helping us discover new names we’ve come to love, Saks is always on our radar. Free People – This boho brand is feminine, whimsical and fun. Taking a page from vintage apparel from the earlier 20th century, Free People makes us wish for a time machine.